For heavy metal in the United States, the 1990’s was a turbulent time where different forms of music commanded the commercial landscape – and what was once popular in terms of strong, in-tune vocals and equally exciting guitar heroes went out the window. Labels would drop bands, tours were scarce – and an angrier form of the movement took shape, leaving many musicians scrambling for appeal in other territories. German guitarist Axel Rudi Pell would develop his solo career from 1989’s Wild Obsession – and gained popularity across Europe for a series of albums that showcased his affinity for classic heavy/power metal and his love of all thing Ritchie Blackmore-related: especially the catalogs of Rainbow and Deep Purple. Yet he has made minor impact stateside – as during those fruitful times, his catalog had no label support for this territory. Knights Call is the latest ARP studio album – the seventeenth in a deep catalog. The band develop a cocktail of mid-tempo to slightly faster anthems, the occasional ballad, and of course epic arrangements that allow the musicians amply interplay and stretch moments. All the while Axel developing electric ecstasy through his soulful licks and tender touch, still vibrant even in his late 50’s. It’s not surprising then when conducting this interview to get swept up into his keen sense of humor and rapid-fire answers. Prepare to learn more about the new album, his previous work as a photo editor at Metal Hammer, his love of cars, and the possibilities of an autobiography of his life in this fun talk. 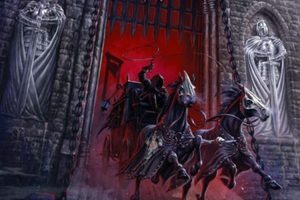 Dead Rhetoric: Knights Call is the 17th Axel Rudi Pell studio record – what qualities do you believe help you attain a level of consistency and appeal to your fanbase after so many decades in the business? Axel Rudi Pell: I don’t know- because I am a genius (laughs)! That was just a joke, I’m kidding. When I write the songs, the magic is in the air at some point. I am always writing, when I pick up the guitar to rehearse for a bit, sometimes a good riff comes to my mind and I think ‘wow, this is cool’. I am taping these ideas on my cell phone voice recorder to capture these ideas. I’m just writing all over the weekdays and months. Then I put the ideas together- but the magic has to be right. I don’t sit there and say to myself that I have to write at least nine good songs. This does not happen for me, I can’t be creative just by pressing a button. If the magic is right, the songs are there. Dead Rhetoric: Can you give us some insight into songs like “Wildest Dreams” which features some cool keyboard/organ play from Ferdy Doernberg and the almost ten-minute epic closer “Tower of Babylon”? Pell: Yes, of course. I really like both tracks- I really like every track on the album. They are all my new babies, and you picked one or two right now. “Wildest Dreams” is the first shuffle we’ve ever recorded. After the last tour, the Game of Sins tour, my drummer Bobby Rondinelli came to me and asked why we didn’t have any shuffle in any of the songs. He was right, and I thought it was a cool idea- so I wrote that track and in the middle of Italy while we were on that tour, I started to write the riffs that would be “Wildest Dreams” in my mind with the shuffle, and as you said Ferdy is burning on the organ for that one. It has a Deep Purple feel, I definitely borrowed a little bit of that Blackmore feel on the bass too. Everybody has loved that track – and when it comes to “Tower of Babylon”, it’s like an homage to Rainbow with some Led Zeppelin influences in there. 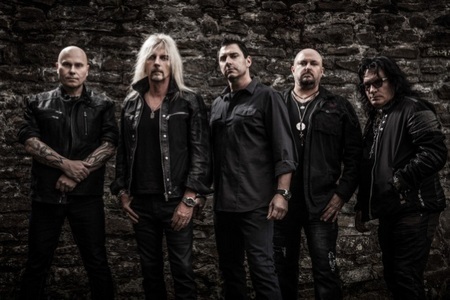 Dead Rhetoric: This is the 20th year as well you’ve been singing with Johnny Gioeli – what have you enjoyed most about his work in the studio and the stage? Pell: I want to see him getting older, getting more grey hair, and getting fat (laughs)! I am kidding again. He has a very special voice. When I listened to the first Hardline record he did back in 1992, I thought it was a cool record and he is a very good singer. I gave him a call about 20 years ago when we did that first record together, which was Oceans of Time, the magic was right. At the beginning we had to find out a solution, because he didn’t know exactly at first what I wanted him to sound like. After all these years we’ve developed in these different directions in the studio, and I’m very proud to have him in my band. He’s perfect for ARP, he can sing everything that I write. Dead Rhetoric: What would surprise us to learn about the relationship that you have with him and all your other band members? Pell: We have a good relationship. The secret behind it is, when you see other bands that are living in the same area, or the same city, they see each other maybe three-five times a week. We don’t do that- we only see each other every couple of months in the studio recording a new album, or when we are going out on the road playing live. This is the main thing why the band relationship between all the members is still great. The magic is still there, everybody is looking forward to seeing each other. Every person tells a different story as to what happened in the meantime between the times that we spend together, and we laugh a bit. We are excited to get back together. It would be a bit harder if we lived in the same city and saw each other all the time. Pell: Yes, but that wasn’t that brilliant breakpoint for myself. The really big thing happened after the first solo album Wild Obsession back in 1989. Two years later, we released Nasty Reputation the second album, and it exploded in Europe. I didn’t expect it, nobody expected that- even my record company didn’t expect that. It was huge, and then step by step we got a little more, a little more. The next breakthrough was when the first ballads record was released back in 1993. That was an amazing selling record in Europe. Like you said, the next step was Black Moon Pyramid, and then Oceans of Time, the first record with Johnny- which I think is still the best-selling record of all the Axel Rudi Pell records that I’ve done so far. Dead Rhetoric: How do you approach your guitar playing and songwriting – as it appears through the years that it’s been just as important to you to develop strong hooks and melodies beyond just being a shredder in the lead break department? Pell: You are absolutely right, that’s 100%. I’m not a guitar player who tries to write a song around the solo. A solo is just a part of the song for me, it doesn’t need to be the situation where the solo shines and the rest of the song is just okay. For me, the main point of a song is the melody, the rhythms, the riffs and they all have to come together- so the solo is just a smaller part of a song. That has to be good of course. Over the years I’ve developed a lot as a songwriter. Maybe 20 years ago or 25 years ago, I wanted to be the fastest guitar player on Earth- it doesn’t matter anymore. It doesn’t matter if you are playing a million notes or three notes- the feeling has to be there. That’s the reason why I have developed everything, because to me, the song has to be the main thing. Dead Rhetoric: Would there ever be a situation where you would consider coming over to North America for a few shows or festival appearances – as I know your primary live touring focus has been across mainland Europe? Pell: I would love that. The problem is I have two Americans in the band – Johnny and Bobby, and I have asked them with every album, ‘what do you think- should we give it a try?’. They both tell me that if I want to lose some money, then do it. If you do this type of show in the United States, it doesn’t matter where- you will be lucky to get 100-120 people. That’s not my intention to lose money, so that’s why we’ve never played the United States unfortunately. The audiences in Europe- every audience is great, but the main point is to get them to move and make them feel happy when they are attending an ARP show. The difficulty sometimes is in a huge festival- we played the Wacken Festival for example in 2016 and we played for almost 100,000 people. Standing on the stage, you look at the sky and see this sea of people. They are there because it’s cool to be at a festival, but they all are not ARP fans. You have to get to the people, we are rockin’ and kickin’ – nobody ran away, so that’s cool. Dead Rhetoric: Is there a different outlook to playing to those festival audiences compared to when you are doing your own small theater shows headlining? Pell: Yes, you have to get everybody. When we are playing our own headlining shows in Europe, you know exactly that the people are coming know what to expect. They paid their hard-earned money for the show, and they are seeing Axel Rudi Pell perform- so it’s easier to (touch) them than it is an audience which is not as comfortable with us. Dead Rhetoric: Do fellow guitar players or musicians ever ask you for tips and advice, music business-related or instrument-related – and if so, what topics or ideas do you try to get across to them? Pell: Sometimes I get fans of the show that ask afterwards about what kind of guitar and effects I’m using. Other times they will ask me if I can give them the notes for a certain song – and I tell them that I can’t right now. Sometimes those things happen, sometimes they don’t. Dead Rhetoric: Obviously the business and consumption model for music has evolved and changed drastically from your initial start in the scene to today. How have you adapted to the changes – and do you believe it’s important to assemble the right team around you to navigate these changes and remain sane/stable? Pell: Nowadays what I can say about any change within the music industry, it’s much more… it’s hard to get anything going on. Nobody likes to pay anything for music- everybody can illegally download any band’s output. They don’t want to pay for music- and maybe that’s okay for me because of how long I’ve been around – people don’t want the physical product to take up too much space anymore in their rooms I guess. When they download it and they pay for it, that’s okay- but when they download it for free, they are killing music. In a couple of years, there won’t be any more record companies because everybody wants everything for free, so they won’t be able to pay musicians for any production work because there will be no new music. Pell: Absolutely. These days, somebody can put up a self-made video clip of us and put it on YouTube – and it will get three to five million hits, but do you know what I can buy from that? Maybe an ice cream. That’s really bad, and the people don’t see that. Dead Rhetoric: What can you tell us about your photo-editor days working at Metal Hammer magazine in Germany and how you finally decided to walk away to pursue your music career full time in 1993? Pell: That was a very cool job. I worked there for nearly seven years. I got to see the other side, and that’s very good- because as a musician you often only get to see one side of the business. I saw a lot of people coming in from other ventures – they found out I was working there, and they thought I would be the one writing the five-star reviews. I told them, no- I am only the photo editor, I take care of the photos and to be there for the production to get the features done in time. It was cool, I worked with a lot of US companies that would supply me pictures. There was no internet and e-mail, we would send faxes back and forth. I quit that job in 1993 because the magazine was bought by a different guy and he wanted to move away from my area that I lived at the time around Dortmund to Munich- and that’s way in the south of Germany. I said I couldn’t do that, I had my family here and that’s the reason why I didn’t continue with it. And I didn’t have to work at the time doing the day job, because my music career was paying the bills. Dead Rhetoric: You have a hand in the bookkeeping and merchandising aspect for Axel Rudi Pell as well as all the other hats you juggle. What is your thought process behind some of the items you offer for merchandise at shows – and do you take fan feedback under consideration? Pell: Yes, definitely. When the new album comes out, I’m definitely thinking about the merchandise for the tour. You have to sell something to get the ball rolling. I’m the guy who likes to say I want part of this element from the front cover on the t-shirt, and design it with something special in mind. I do design some of these t-shirts by myself, as I do (that) with a program on my computer. Then I pass it on to other people who can design things a little better than myself, so they know exactly what I want and what I have in mind. I never would sell a shirt without 100% permission from myself. Dead Rhetoric: You also have a passion for cars and Formula One racing – when did this start and have you had the opportunity to take in some races or meet some drivers that you love? Pell: This Formula One thing, it’s over now for me. Over ten years, I used to be a fan and I lost interest when Michael Schumacher retired. I never followed it up again. The last race in Formula One that I watched was maybe a couple of years – perhaps by accident. I’m still into cars- I have my own sportscar, and its custom built with parts that you can’t buy officially. It’s really cool, a big car. And of course, you can take it out on the Autobahn- we have a few places in Germany where there is no speed limit. When the American guys come over, they always ask if we can drive on the Autobahn again. I make sure that they aren’t scared- and they say they aren’t. Sometimes they are shocked at how fast we can go- they wish that they could do that in the states. 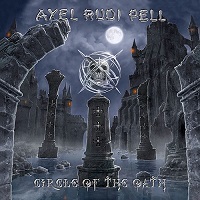 Dead Rhetoric: What’s on the horizon for Axel Rudi Pell – as I’ve heard that you often plan your career a year to three years in advance? Would you ever consider developing an autobiography of your life and career? Pell: At some point, I thought about (writing an autobiography). A couple of years ago, but I think there are a few more years left, because there are plenty more things that I believe will happen for ARP in the future. I don’t want to die before I write my book. There is plenty of time left- maybe I will do this in eight to ten years. The first leg for the European tour will start around April and continue through May. Then we will do some festivals all over Europe in June, July – and then we will do the second leg of a headlining tour which will take place in October and November. And then probably we will do a third leg in the beginning of February through April of next year.